Daniel Blau Ltd. and Galerie Meyer are pleased to present ALLER-RETOUR, an exhibition of pictures from the Apollo X1 journey to the Moon. These works are arguably the ultimate reflection on the theme “The Journey”, the subject of Photo Saint-Germain-des-Prés 2012. This journey’s departure, destination and return extend beyond space and time into the realm of the unknown. Space exploration has once again captivated the public with the recent landing of Mars rover “Curiosity”, which has produced unparalleled views of the “Red Planet”. Moreover, the recent passing of Neil Armstrong on August 25, 2012 is a poignant reminder of the monumentality and timeless intrigue of space in relation to mankind. Armstrong, reflecting on his journey to the Moon revealed: “the unknowns were rampant”. 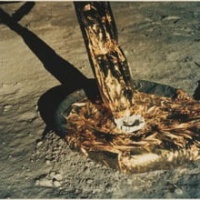 Set within the backdrop of the Cold War, with intense political tension between the United States and the USSR, the lunar module dubbed “The Eagle” landed Armstrong and Aldrin – with only thirty seconds of fuel remaining – on the Moon in July of 1969. An estimated 550 million people witnessed this undeniably historic event, as Armstrong and Buzz Aldrin explored the Moon’s surface for the very first time. 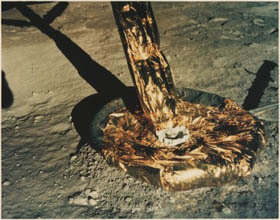 Photographed over two hours while documenting and sampling the Moon, these original photographs remain the most expensive pictures ever taken in terms of their cost of production. The “magnificent desolation”, as Aldrin described the surface of the Moon, had been photographed via telescope by Lewis Morris Rutherford in the 19th century. However, these 1969 photographs of an unprecedented clarity, the result of unfiltered sunlight in situ, epitomize the magnificence of space. The glorious nostalgia of this fortunate era is reflected in these incredible photographs. 50 years after the first man orbited Earth, the splendour and sublime quality of these groundbreaking pictures of the Moon continue to evoke wonder.